GENERAL Brian Peddle set out a clear but challenging vision for The Salvation Army at his welcome meeting in William Booth College, London. He called on the congregation of more than 400 people – and in excess of 10,000 viewers watching the live stream – to ‘be The Salvation Army that God needs us to be in this 21st century’. In a meeting that included many thought-provoking moments, perhaps the most moving was when the General and Commissioner Rosalie Peddle (World President of Women’s Ministries) made their way from the platform to kneel at the mercy seat. The General encouraged everyone present to join him and Commissioner Peddle in committing themselves to God’s service by kneeling at the place of prayer or standing where they were. Quietly, with no fuss or hesitation, the members of the congregation did just that, while the International Staff Songsters (ISS) sang ‘Bow the Knee’. The meeting began in lively fashion, with members of Croydon Citadel Singing Company racing down the aisle, cheering and waving flags. They were followed by International Headquarters flag-bearers and then – to clapping and cheers from the congregation – the Chief of the Staff (Commissioner Lyndon Buckingham) and Commissioner Bronwyn Buckingham (World Secretary for Women’s Ministries) marched in. Finally, the General and Commissioner Peddle marched to the front, greeted by prolonged applause. In her prayer, Commissioner Bronwyn Buckingham spoke about the Day of Prayer for Victims of Human Trafficking that was being marked by the international Salvation Army. Calling God to bring freedom to the millions of people caught up in modern-day slavery, she acknowledged that ‘these are big prayers – but you are an even bigger God’. A time of music led by the William Booth College Worship Team was followed by a video showing prayers by Salvation Army young people from around the world, praying for the new General and for the Army’s worldwide mission. Regent Hall Band’s ‘Fill the World with Glory’ was followed by a Scripture reading by Fredah Mfundisi – a fellow soldier of the international leaders at Southwark Corps (church). A lively version of ‘Jesus, be a Fence’ by Croydon Citadel Singing Company was accompanied by images of young people’s music groups from around the world. Commissioner Betty Matear dedicated the new leadership team to God in prayer, calling on him to bless each person. Offering a welcome on behalf of the soldiers, Dr Marjory Kerr (President of The Salvation Army’s Booth University, Canada) recognised that while some soldiers lived and worshipped freely, there were others for whom ‘every day is a challenge’. She called on the General to engage with his soldiers and to ‘be prepared to test everything – with us’. After the ISS created a worshipful atmosphere through ‘In the Name of the Lord’, Commissioner Peddle responded to the words of welcome. She began with a public thanks for the huge number of cards and emails she and the General had received since his election. Referring to her role as World President of Women’s Ministries – or ‘The Salvation Army’s mother’ as she has been called – the commissioner spoke of the huge challenges faced by women and girls around the world. She vowed to ‘future-proof’ The Salvation Army’s women’s ministries work, ensuring it was ‘relevant, ready and resourceful’. Commissioner Peddle spoke with great affection about her and the General’s support from and love for their family, so it was appropriate that her words were followed by a song – ‘He Leadeth Me’ – presented by their daughters, Captain Krista Andrews and Stephanie Forystek. The General began his Bible message by asserting his certainty that God’s blessing is on The Salvation Army. He added to this two beliefs – that the world needs The Salvation Army, and that the world deserves a Spirit-filled Salvation Army. He presented his call to The Salvation Army – a call to mission. Using the themes ‘Be Ready’, ‘Be Engaged’ and ‘Take Responsibility’, he told the congregation in the hall and thousands watching online: ‘God is calling us to be ready for his mission … Engaged right where he has placed us – or where he is calling us’ and that Salvationists and friends need to take responsibility for fulfilling God’s mission, ‘even at personal cost’. He had nine calls for the worldwide Salvation Army – starting with calls to prayer and holiness, and a call to be battle-ready. ‘The days of mediocrity are over,’ he cried, adding that it was time to ‘take back what the devil has stolen’. Calling people to serve, he explained: ‘We are not a reserve Army!’ He called people to worship (‘Let’s start inviting people to Jesus!’) and to be confident in the gospel. 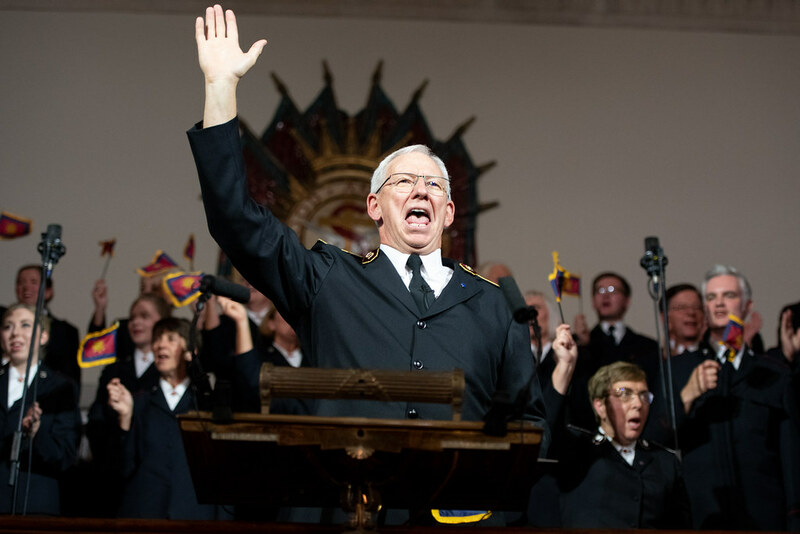 There followed sacred moments that saw the whole congregation respond to the General’s words of challenge, aided by the congregational singing of ‘Lord, I Come to You’. The meeting finished with the rousing singing of ‘Storm the Forts of Darkness’ before the congregation made its way out to share refreshments and a time of fellowship with the international leaders.